Is something in the air of this tiny little riverside town? 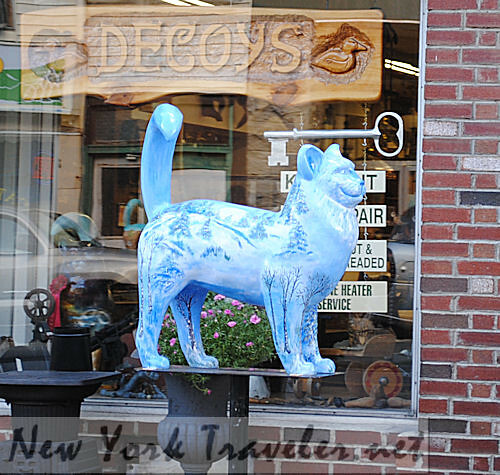 Catskill, NY, just seems to exude creativity and whimsy. Washington Irving’s Rip van Winkle supposedly slept in this region; Samuel Wilson, the butcher who later became known as Uncle Sam, was born here. The Hudson River School artists were based here. And the region remains a veritable playground for artists and lovers of art. 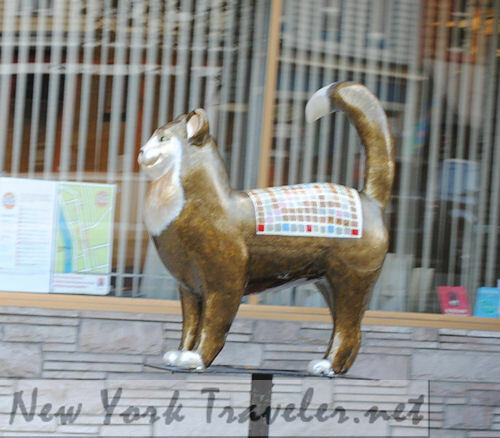 When we visited Catskill, NY, after seeing Frederic Church’s Olana Historic Site, we were delighted by rows and rows of colorful cat statues all along Main Street. 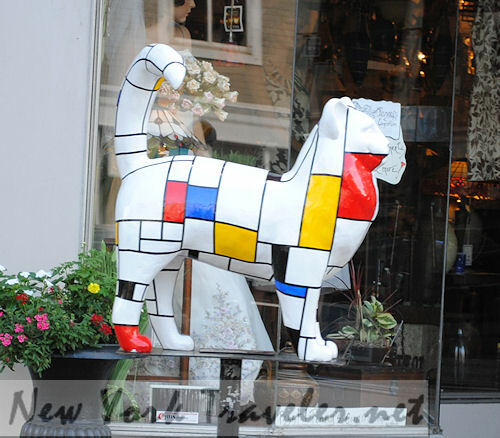 As an avid cat lover, I “pawsed” to enjoy the colorful and themed art for each cat: police cat, Scrabble cat, cubism cat, rainbow cat, and dozens of other cats competing for parking meter space up and down the avenue. We saw the cats everywhere! 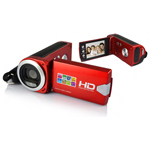 Unfortunately, some of the images are blurry as we snapped photos as we drove down Main Street. 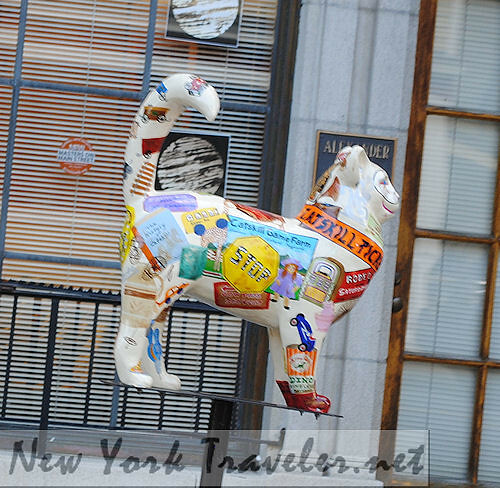 I wondered what was the history behind these cats– who did them and why are they there? 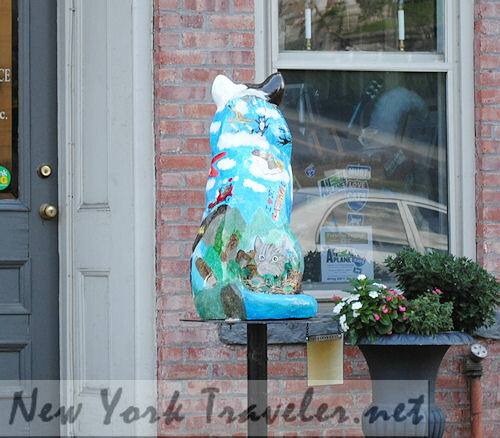 I did some digging and discovered that the cats are part of a fundraising event for various charities in Catskill, NY. Over the years, the cats have raised hundreds of thousands of dollars! The cats are constructed of fiberglass. Local artists paint and design the cats into incredibly creative works of art. The cats go on display from Memorial Day to Labor Day, and are then auctioned off to the highest bidders. The money raised goes toward various organizations and the event has revitalized a once-ailing Upstate New York town. Artists get 30 percent of the auction proceeds, too. The designs are all very lovely, but we have our favorites. 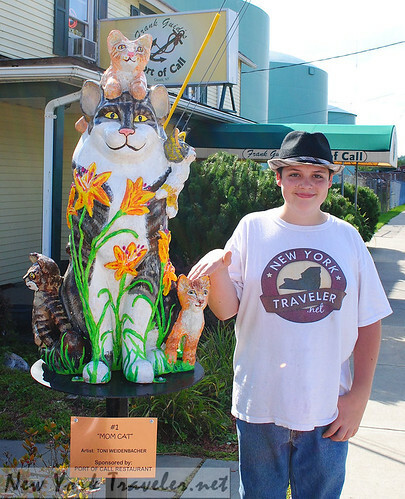 You can see this year’s photo gallery at the Cat-n-Around Catskill 2011 website at www.cat-n-around.com/artists.html. There are 55 kitties on display! I love a town that loves cats! There was even one bear on display. I don’t know what was up with that. Glad you loved the kitties. 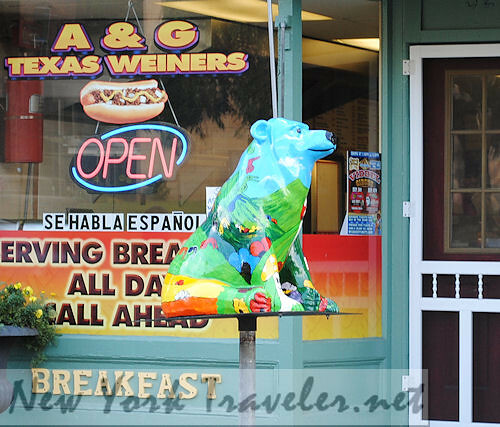 The bear is from the town of Cario where they do bears. If you saw the bicycle cat, that was Andy, the mountain cat biker, he was the one I did.